For hundreds of elementary- and middle-schoolers in Lane County, daydreams of thrilling outdoor exploration during class are now a reality: That’s a crucial part of their math and science education, thanks to new teaching standards nationwide. Forty Lane County school teachers — teaching third through eighth grade — are partnering with the University of Oregon and local community organizations in an effort to provide more science, technology, engineering and math education, also known as STEM classes. The classes reach students through project-based studies, which often involve a driving question, student choice of material and a public audience for their findings. The partnership is made possible by a grant awarded to the UO by the Oregon Department of Education and funded by the United States Department of Education through the Elementary and Secondary Education Act. Throughout the academic year, local teachers participate in the university’s grant-funded course focused on math and science project-based teaching. In the class, teachers work with university faculty to develop lesson plans and class projects — called Content in Context SuperLessons, or C2SL — that focus on addressing open-ended questions that involve real-world problems. Fifteen teachers enrolled in the course last February, immediately after the UO received the grant, and another 25 teachers joined them in August for the current academic year. The teachers come from seven out of 16 school districts in Lane County. As part of the course, the UO also facilitates a partnership between teachers from the school district and representatives from community organizations, including the Eugene Water and Electric Board, BRING Recycling, Lunar Logic, PeaceHealth Laboratories and several other groups who come to classrooms and help lead math and science projects. With the new standards in place, project-based math and science teaching has become the norm in Lane County. With the projects, there’s a specific focus on authenticity and a connection to real-world professions. Utilizing their Content in Context SuperLessons, teachers are getting students outside to explore nature, facilitating meetings with community organizations during class visits and taking field trips all over the state so students can get the practical experience they need to fully engage with the academic material. One of the projects, led by Patterson, was recently featured by the Springfield School District on their website. 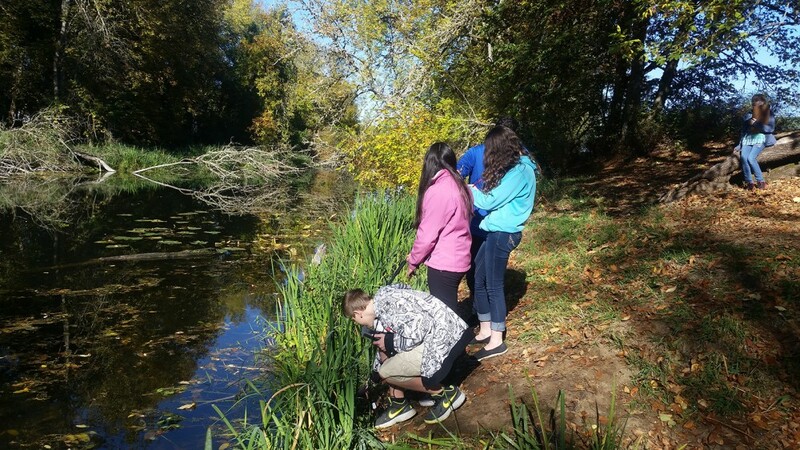 Around 180 seventh-graders at Agnes Stewart Middle School are answering the question, “How can we as students educate the public about the value of our local natural area?” through projects scheduled throughout the academic year. They’ve been exploring the wetlands around their school and learning about different topics related to natural resources in the area — topics like preservation of native plants and animals, restoring the Mill Race, park planning and the science behind water quality issues.